Old Tucson Studios is about to hold an 80th birthday party, complete with cake. TUCSON, Ariz. — Old Tucson Studios is about to hold an 80th birthday party , complete with cake. "Columbia pictures came back out when they were looking for a spot to shoot the movie Arizona," recounted Old Tucson Historian Marty Freese. "So they built the town of old Tucson (circa) 1860s." Columbia Pictures used over 200 laborers, including members of the Tohono O'odham Nation. "They built 60 buildings out of adobe brick to look exactly like old Tucson," said Freese. "They built it fast, six weeks. They spent over two and a half million dollars on the picture. Which was a huge sum back then." By the mid to late 1940s Hollywood began to film many of its Westerns at Old Tucson Studios . During the 1950s it earned the nickname "Hollywood in the Desert." "You're talking about people like John Wayne, Burt Lancaster, Kirk Douglas, Audie Murphy, Randolph Scott, Paul Newman," said Freese. "They all walked up and down these streets and worked here. There's hardly anyplace in Tucson where you find the history that you find right here." A major part of that history involved John Wayne in the 1960s. He filmed Rio Bravo, McLintock, El Dorado and Rio Lobo at Old Tucson Studios. 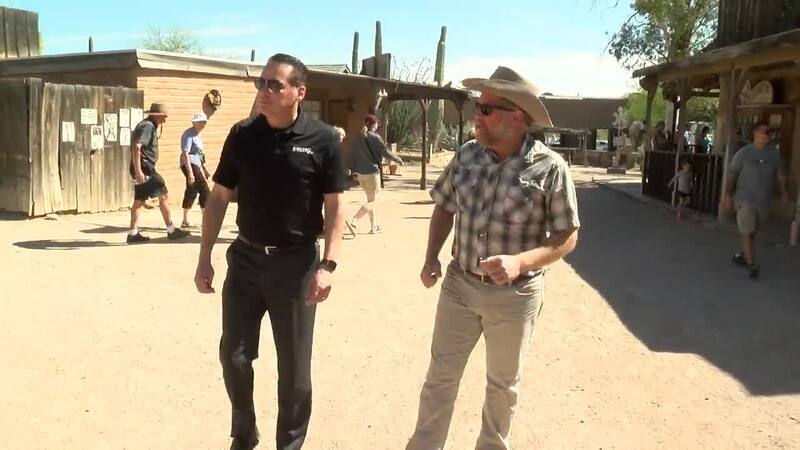 Freese takes visitors on tours, showing them the exact spot of John Wayne movies and other classics. Hundreds of movies and TV shows have used Old Tucson as a filming location. Since 1960, Old Tucson has also been doubling as a theme park, the idea of owner Bob Shelton. "He hired a fellow named Jack Young who was at that time a semi-retired Hollywood stuntman," remembered Film and Entertainment Production Manager Rob Jensen. "He came in here and created the original shows for Old Tucson. They had half a dozen different street shows that they would do. He created the full contact stunt fighting that we still do today." Jensen and his stuntmen continue that tradition begun by Young, and Old Tucson continues to thrive. It came back after the devastating fire in 1995, which destroyed much of Old Tucson Studios. Today, it still manages to attract small independent film makers, while the big budget pictures are shot elsewhere. "We always keep rising to the top again," said Old Tucson Media Relations Manager Mary Davis. "I think that's the strength of Old Tucson, that heart and that passion. Everyone who works here continues to devote themselves to preserving the western lifestyle and sharing that with our guests who come from all over the world." Old Tucson has added events like the mud run and the Halloween favorite Nightfall. New this year is the Outlaw Zipline, the only laser shooting zipline in the world. There are future plans for expansion. After 80 years, Old Tucson Studios is Absolutely Arizona.